In 1939 John Graham “Jock” McNiven accepted an offer to become the manager of a new mine under development on the west shore of Yellowknife Bay (map). As a 1923 graduate of the University of Toronto (M.Sc. in Mining Engineering) McNiven had worked in the mining industry for more than fifteen years prior to accepting this position. This mine, a kilometre south of the Con Mine dock and well within the present day Yellowknife city limits, had the unusual name Negus. The Negus claim was staked in 1935, the same year both the Con and Giant claims were staked further north in Yellowknife Bay. While the Con and Giant claims had gold imbedded in white quartz the Negus gold was in black quartz and this became the origin of the mine’s name. In 1936 a mining engineer from Toronto was examining the claim prior to recommending its purchase by an Ontario mining consortium and noted the black quartz. He suggested the claim be named for the “black emperor so prominent in the news of late”. This was Tafari Nakonnem who, in 1928, became King Negus Negusta and on November 3 rd, 1930 was crowned Emperor of Ethiopia and became "King of Kings, Lord of Lords, Conquering Lion of the Tribe of Judah" or, more commonly, His Imperial Majesty Haille Sellasie, a man still highly revered by the Rastafarians of Jamaica and the subject of many Reggae songs. Jock McNiven, perhaps taking inspiration from the name of the mine he managed, also sought recognition as a leader in his community. In 1947 he became the first northern resident to be appointed to the Council of the Northwest Territories. Prior to 1947 the Northwest Territories’ government was made up only of southern-based bureaucrats. When Negus mine closed in 1952 McNiven became a consulting engineer based in Yellowknife. On January 1 st, 1954 he became, by acclimation, Yellowknife’s first mayor. 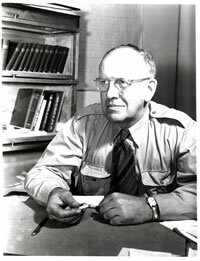 From 1955 through to his retirement in 1965 McNiven was Manager of the Eldorado Mining and Refining Limited Port Radium mine. John Graham McNiven died at his Salt Spring Island home in September of 1969.